Description of a new Electrometer. IV. Description of a new Electrometer. In a letter from the Rev. Abraham Bennet, M.A. to the Rev. Joseph Priestley, LLD, FRS. I send you a description of my electrometer, which, having the honour of your approbation, may be communicated to the Royal Society. (See Tab II. fig.1. and 2. which represent two sections of the Instrument). peg, which is made round at one end and flat at the other, two slips of leaf gold are fastened with paste, gum-water, or varnish. These slips, suspended by the peg, and that in the tube fast to the center of the cap, hang in the middle of the glass, about three inches long, and a quarter of an inch broad. In one side of the cap there is a small tube g, to place wires in. It is evident, that without the glass the leaf gold would be so agitated by the least motion of the air, that it would be useless; and if the electricity should be communicated to the surface of the glass, it would interfere with the repulsion of the leaf gold; therefore two long pieces bb of tin-foil are fastened with varnich on opposite sides of the internal surface of the glass, where the leaf gold may be expected to strike, and in connexion with the foot. The upper end of the glass is covered and lined with sealing-wax as low as the outermost rim, to make its insulation more perfect. Tab.III fig.1. represents the instrument joined together, and ready for use. The following experiments will shew the sensibility of this instrument. See Tab. IV. The positive electricity of the chalk, thus blown, is communicated because part of the powder sticks to the cap; but the negative is not communicated, the leaf gold collapsing as soon as the cloud of chalk is dispersed. 2ndly, A piece of chalk drawn over a brush, or powdered chalk put into the brush, and projected upon the cap, electrifies ot negatively; but its electricity is not communicated. Fig.4. 3dly, Powdered chalk blown with the mouth or bellows from a metal plate placed upon the cap, electrifies it permanently positive. Fig.5. Or if the chalk is blown from the plate, either insulated or not, so that the powder may pass over the cap, if not too far off, it is also positive. Or if a brush is placed upon the cap, and a piece of chalk drawn over it, when the hand is withdrawn the leaf gold gradually opens with positive electricity as the cloud of chalk disperses. 4thly, Powdered chalk falling, from one plate, to another placed upon the instrument, electrifies it negatively. Fig.6. Other methods of producing electricity with chalk and other powders have been tried; as projecting chalk from a goose wing, chalking the edges of books and clapping the book suddenly together, also sifting the powder upon the cap; all which electrified it negatively: but the instrument being placed in a dusty road, and the dust struck up with a stick near it, electrified it positively. Breaking the glass tear upon a book electrified it negatively, probably by friction in the act of shivering, for when broken in water it did not electrify it. quick-lime, umber, lapis calamnaris, Spanish brown, powdered sulphur, flowers of sulphur, iron filings, rust of iron, sand. Rosin and chalk, separately alike, were changed by mixture; this was often tried in dry weather, but did not succeed in damp: white lead also sometimes produced positive, and sometime negative, when blown from a plate. If a metal cup be placed upon the cap, with a red-hot coal in it, a spoonful of water thrown in electrifies the cup negatively; and if a bent wire be placed in the cap, with a piece of paper fastened to it to increase its surface, the posotive electricity of the ascending vapour may be tried by introducing the paper into it. Perhaps the electrification of fogs and rain is well illustrated by pouring water through an insulated cullender, containing hot coals, where the ascending vapour is positive, and falling drops negative. Fig.7. The sensibility of this electrometer may be considerably increased by placing a candle upon the cap. By this means a cloud of chalk, which only just opens the leaf gold, will cause it to strike the sides for a long time together; and the electricity, which was not before comunicated, now passes into the electrometer, causing the leaf gold to repel, after it is carried away. Even sealing-wax by this means communicates its fire at the distance of twelve inches at least, which it would scarcely otherwise do by rubbing upon the cap. A cloud of chalk or wheat flour may be in one room, and the electrometer, with its candle, be afterwards leisurely brought from another room, and the cloud will electrify it before it comes very near. The air of a room, adjoining to that wherein the electrical machine was used, was very sensibly electrified, which was perceived by carrying the instrument through it with its candle. Fig. 8. In very clear weather, when no clouds were visible, the electrometer has been often applied to the insulated string of kites without metal, and their positive electricity caused the leaf gold to strike the sides; but when a kite was raised in cloudy weather, with a wire in the string, and when it gave sparks about a quarter of an inch long, the electricity was sensible by the electrometer at the distance of ten yards or more from the string; but, when placed at the distance of six feet, the leaf gold continued to strike the sides of the electrometer, for more than an hour together, with a velocity increasing and decreasing with the density or distance of the unequal clouds which passed over. Sometimes the electricity of an approaching cloud has been sensible without a kite, though in a very unfavourable situation for it, being in a town surrounded with hills, and where buildings encompassed the wall on which the electrometer was placed. A thunder cloud passing over, caused the leaf gold to strike the sides of the glass very quick at each flash of lightening. No sensible electricity is produced by blowing pure air, projecting water, by smoke, flame, or explosions of gunpowder. of the book had lain in a damp place; which conjecture was further confirmed by all the books becoming positive in damp weaher, and one of them being dried at the fire again became negative. When the cap is approached with excited sealing-wax, the leaf gold may be made to strike the sides of the glass more than twelve times; and as the sealing wax recedes, it strikes nearly as often; but, if it approaches much quicker than it recedes, the second number will sometimes be greater. The quantity of electricity necessary to cause a repulsion of the leaf gold is so small, that the sharpest point or edges do not draw it off without touching; hence it is unecessary to avoid points or edges in the construction of this instrument. V. Appendix to the Description of a new Electrometer. In a Letter from the Rev. Abraham Bennet, MA to Charles Blagden, MD Sec.RS . The following description of my Electrometer, connected with M VOLTA's Condenser, waits on the approbation of the Royal Society, to be inserted in the Philosophical Transactions, as an Appendix to my Paper, communicated by Dr PRIESTLEY. presenting it to the cap of the electrometer (if not still in too small a quantity) it will cause a divergence of the leaf gold, by an electricity of the same kind with that which was communicated to the cap, and in which cap a small quantity of electricity remains. Thus both the larger and smaller condensers of M VOLTA are connected with the electrometer, so as to be used in the most simple, expeditious, and convenient manner I can think of. Their amazing power of condensing electricity is sufficiently explained in M VOLTA's Paper, before published in the Philosphical Transactions. 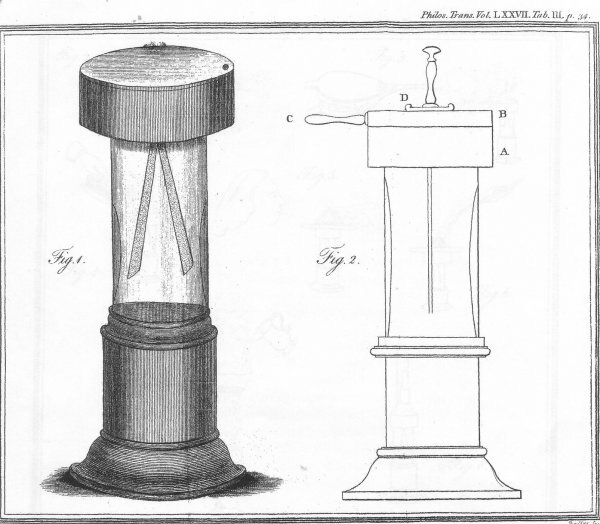 To the experiments on blowing powders from a pair of bellows I have to add, that if the powder is blown at about the distance of three inches upon a plate which is moistened or oiled, its electricity is contrary to that produced by blowing upon a dry plate. This shews that the electricity of the streams of powder issuing out of the bellows is only contrary to the more expanded part, because it is within the influence of its atmosphere; for when this is destroyed by the adhesion of the powder to the moistened plate, it is negative when the bellows are positive, as it was before positive when the more expanded cloud was negative. 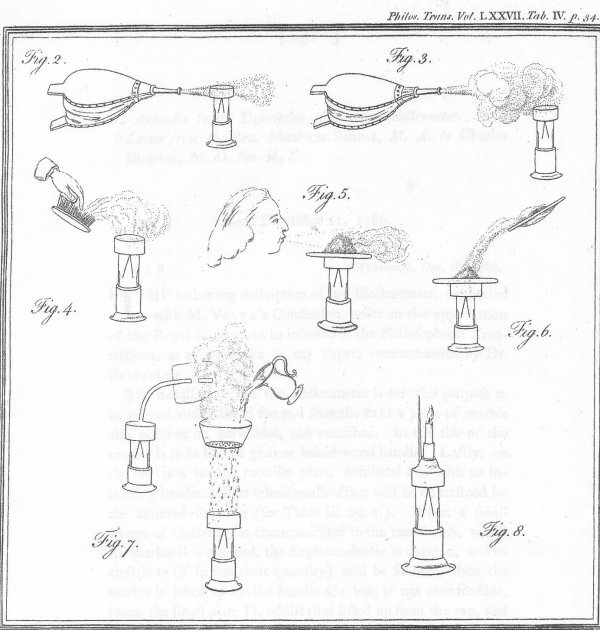 I have also to add, that the experiments on evaporation of water may be tried with more ease and certainty of success by heating the small end of a tobacco pipe, and pouring water into the head, which, running down to the heated part, is suddenly expanded, and will shew its electricity when projected upon the cap of the electrometer, more sensibly than any other way I have tried. 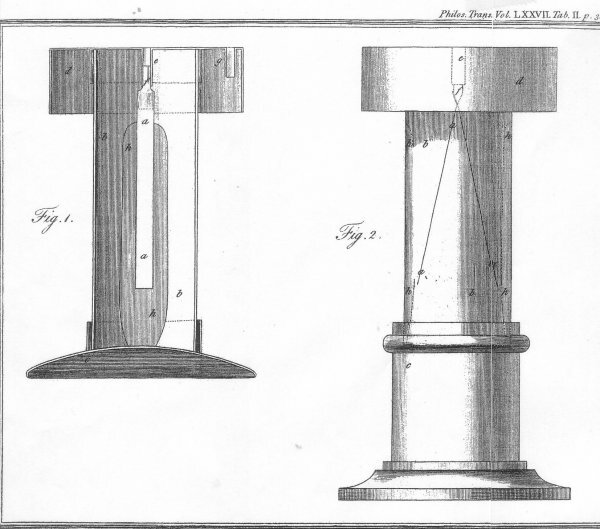 If the pipe be fixed in a cloven stick, and placed in the cap of one electrometer, whilst the steam is projected upon another, it produces both electricities at once. Spirit of wine and ether are electrified like water. Oil and vitriolic acid produced smoke without any change of electricity. In these experiments a long pipe is better than a short one.